1. I am happy to be here for the 94th Convocation of the University of Delhi, one of the most valued institutions of higher learning in our country. I offer my greetings to the Vice-Chancellor, faculty members and, most important, the graduating students and their family members. This is a big day and a memorable moment for all of you. 2. I congratulate the degree holders and medal and prize winners present here today. There are 672 degree holders and 171 medal and prize winners among us. I understand that 112 of the medal and prize winners are girls – almost a two-thirds majority. This is in keeping with the trend in education in recent times, with girls consistently outscoring boys! It is a welcome sign in our society. 3. In addition to those who are here, 125,000 students will receive their degrees in absentia. Each one of you is an achiever. Your achievement is the result of your hard work over the years. It is also the result of the dedication of your teachers and faculty members of the University of Delhi. And we must not forget that it is the outcome of the support all of you have received from your parents and family members. 4. Learning is a never-ending process. This convocation is only a milestone in the journey that is education. Nevertheless, graduating from the University of Delhi has given you a firm foundation. I am sure it has empowered you to achieve more and aim higher as you walk into the world outside. 5. The University of Delhi was established in 1922. It had a modest beginning, with just three colleges, two disciplines and 750 students. Today, it is one of the largest universities in the world. It has 54,000 undergraduate and 10,000 post-graduate students. The University comprises 16 disciplines – including medicine and technology – and 86 academic departments. Seventy-seven colleges and 28 centres and institutes are affiliated to it. These numbers are impressive by any standards. 6. More than numbers, however, it is the University of Delhi’s reputation for scholarship and excellence that has made it a magnet for students. Students come here from all over the country, as well as other parts of the world. They come for a sweeping range of courses and academic programmes. This University offers both cutting-edge research in scientific fields as well as deep and insightful understanding of the humanities. 7. The University of Delhi is constantly updating itself and keeping its academic programme meaningful for a contemporary generation. For example, in 2017, the University established the Delhi School of Journalism to offer a structured education in the practice and theory of media and mass communication. And in the academic year 2017-18, it is introducing a one-year post-graduate diploma course in cyber-security. 8. These are very different learning experiences. Yet, both are relevant to our times, and to our age of communication and technology. 9. Higher education is becoming increasingly competitive. New institutions and universities are offering options for students. Within the existing network of colleges and universities as well, there is strong competition to attract talent – both faculty and students. In this context, I welcome the National Institutional Ranking Framework initiative taken by the Ministry of Human Resource Development. 10. I have been told that under NIRF six colleges of the University of Delhi are ranked in the first 10 in our country. This is a commendable performance. It must be an inspiration to go higher. 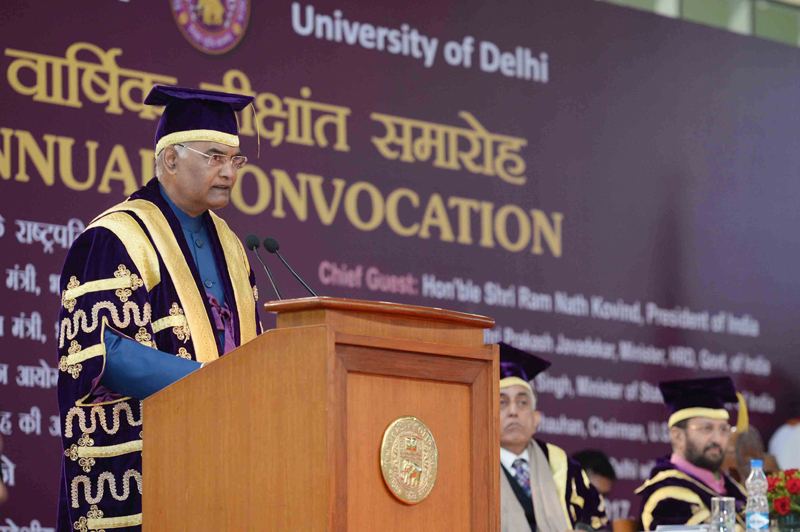 Our immediate aim should be to take the University of Delhi into the ranks of the world’s top 200 universities. 11. In 2022, only five years from now, the University of Delhi will complete its centenary. It is advisable to plan that celebration by looking ahead. The centenary will be the culmination of a journey but also the beginning of a new voyage – a voyage that will take the University into the heart of the 21st century. We are a youthful nation. Sixty-five per cent of India’s citizens are below the age of 35. With this age profile, the challenge before our educational institutions will be very different in the coming years. There is also the impact of technology on how we live and work – and learn. 12. We are entering a world where Artificial Intelligence is changing not just how our society ‘does’ but how it ‘thinks’. We are at the edge of a society of cognitive machines. As such, the challenges and the opportunities before us – and particularly before those who are graduating today -- are immense. 13. Our leading institutions, such as the University of Delhi, will need to adapt as well. They will need to innovate – both in terms of academic content and mechanism of delivery. Traditional barriers between fields that were once regarded as sacrosanct are breaking down. New courses and programmes will have to be devised if our education system is to answer the needs of the next 25 or 30 years. Some of these may call for adopting a multi-disciplinary or inter-disciplinary approach. 14. The capacity of physical classrooms is obviously limited. We need to explore how we can use technology to take scholarship and education further. The University of Delhi, like many other universities across the world, has taken steps to begin Massive Open Online Courses. As broadband penetration deepens in our country, I see great hope in the MOOC platform in the years ahead. It has an exciting potential to democratise knowledge. 15. Higher education serves many purposes. For a start, it prepares students for different vocations and for the job market. But that is only one purpose of higher education. At the end of the day, universities are truly meaningful only if they promote the adventure of learning and the exploration of knowledge. Blue-sky innovation is the test of a genuinely world-class higher education system and institution. 16. It is critical to find the right balance between these different demands on our universities. Quick wins have their place, but universities cannot lose sight of the long-term goal of building a knowledge society and an innovation society. Mobilisation of the vast University of Delhi alumni network should also be encouraged. A way has to be found to allow them to easily contribute their intellect, resources and time in renewing their University or their individual colleges. And in mentoring students. 17. With all these responsibilities, and with the increase in both its student population and the courses on offer, the University of Delhi needs to enhance its capacities. I am told that there are certain vacancies at the level of college principals and senior faculty positions. I am confident the University authorities and college managements are taking all steps to fill these positions at the earliest, and this is what has been confirmed by the Vice Chancellor. 18. The University of Delhi is in many ways the University of India. Every state and region of our country is represented here. Each year thousands of eager young boys and girls travel to Delhi and apply to the University of Delhi or its affiliated colleges. I must especially mention that the University is a big attraction for many young students from the Northeast. They add to the richness and vibrancy of the University campus and of the city of Delhi. 19. Here I may add that beginning tomorrow I am travelling for four days to the Northeast. It will be my first trip there as the President of India. And I am planning to go again very soon. 20. In conclusion I would once more like to congratulate all of you, especially the medal and prize winners. You are leaving with the stamp of one of India’s leading universities and you are going into a world buzzing with possibilities. Do well in your careers, make your alma mater proud, and value with humility the privilege of your education. 21. And in whatever manner you choose, please give back to society. Help those who are marginalised and less fortunate. That is and that must always be the true test of your education and your degree.